On Aug. 23, my husband, Asaf, and I welcomed our first child. Elyse Stella entered the world at 33 weeks — she could not wait. Steve ’71 and Sherry (Forman) Litwack ’73, P’03, are the proud maternal grandparents. We live in Arlington, Massachusetts, and see Michaela May and her family of four quite a bit. In July, Elyssa Joy (Auster) Austerklein became senior rabbi at Beth El Congregation in Akron, Ohio, where she is co-clergy with her husband, Hazzan. A painting created by Ari Lankin is being used as art on a box of Trojan condoms. After the painting was created for an MTV/Trojan collaboration for the Video Music Awards, Ari worked with the Trojan team to develop the art for the condom box and foil wrappers. On Aug. 19, Gregory Lawrence and his wife met their second child, son Ember Lev. Stephen Medow married Jessica Feinstein on Nov. 11 in Big Indian, New York. Alumni in attendance included Stephen’s younger sister, Betsey Medow ’08; Mod 17’s finest, David Lantsman, IBS MA’04, IBS MBA’14, Noah Browne, Daniel Braunfeld and Ariella (Stober) David, IBS MA’04; and Brian Ashin, Marianna (Zilberman) Ashin, Amy Spielholtz, Mara (Michaels) Braunfeld, Zack Mabel ’04, David Tepel ’02, David Center ’02, Matt Friedman ’02, David Klein ’02 and Adam Frost ’02. The couple resides in New York City. Yaser Robles helped edit the book “Dynamics of Community Formation: Developing Identity and Notions of Home.” Eliza Agrest Varadi, who has a pediatric medical practice in Charleston, South Carolina, was elected an early-career physician representative in the American Academy of Pediatrics. She and her husband, Vladimir, welcomed their third child, Ariel, who joins siblings Daniel and Gabriella. 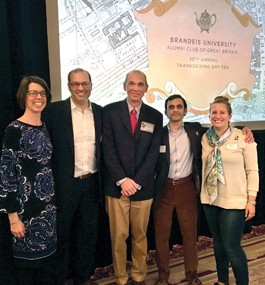 BRANDEISIANS TO A TEA: Lecturer in legal studies Dan Breen (center) discussed U.S. Supreme Court Justice Neil Gorsuch at the Alumni Club of Great Britain’s 30th annual Thanksgiving Day Tea. Also pictured: Sharon Rosenberg ’00, director of alumni relations, and club co-presidents Joshua Pines ’96; Anant Jani ’03, MS’03; and Maayan Amitai ’07.